Be at the next Soul Session. a new black arts movement presents commUniversity. honoring the month of revolutionary matriarchy and making the connections with the black liberation struggle and the struggle of the irish liberation movements. film screening TBA (hopefully the Black and the Green - a film about the black liberation and irish liberation movement, its a hard one to get so we are working on it) followed by discussion/strategy session on the connections with the BLA and the IRA and solidarity connections in between from Fredrick Douglass to Marcus Garvey to Bernadette Devlin. A process must be developed to produce a 'revolutionary culture'; a 21st century extension/off-shoot of the 'Black Arts Movement' started by Amiri Baraka! Those amongst our artists, 'students' and the youth must be politicized and revolutionized so that they begin to clearly see the indisputable, absolute need for Revolution! Assimilationist and integrationist 'reform measures' that leave white supremacy, imperialism and capitalism intact will not see any genuine benefit occur in the lives of the masses of People on the planet. Please take the time to review the video and forward it to any 'conscious' artists or youth you know. Insha-ALLAH (GOD willing), you will conclude it to have been time well spent. Peace thru Revolutionary Love & Action! The Movie is a 2011 documentary film by Valerio Lopes. It asserts a number of theory-based ideas born around Amilcar Cabral and the independents and human rights movements he led mainly in the 1960'ies. Amílcar Cabral was a Guinea-Bissauan leader, writer, freedom fighter and politician, he was assassinated in 1973. "Cabralista" reflects the collective memory, how this revolutionary theoretician whose influence reverberated far beyond the African continent is remembered. With never released voice recordings, humanist citations and quotes, timeless footage and cultured visual effects, this film is a unique vision of Africa yesterday and today. Inspired and artistically designed with the fantastic Opus of Amilcar Cabral in mind, the goal of this documentary is to put his theories and ideas in the spotlight. 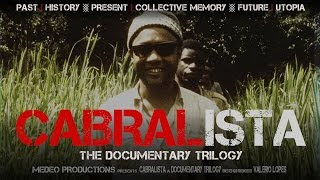 Comparing his work with actual cultural and social issues, like the foreseen north-african revolutions, the countries who helped Cabral in his struggle are identified in this movie by Amilcar Cabral's words that seemed to predict the actual facts. ... and wisdom and support the cabralist concept of re-africanisation of the spirit, recognised all around the world as a pillar of african emancipation. Underlined with musical compositions that put the audience into a unique african atmosphere and supported by his own graphical look. This 52 minutes long film is a mirror of African humanism and socio-cultural evolution and progress. FOR THE LOVE OF REVOLUTION: a Soul-Liberating Dance Party! Join the Eco-Music Big Band for a revolutionary dance party! FOR THE LOVE OF REVOLUTION is a celebration of revolutionary music and struggle that includes queer liberation, third world struggle, womyn's liberation, the struggle for ecologically sound living, and the liberation of black and brown peoples. Featuring a hip hop reimagining of Cal Massey's magnum opus Black Liberation Movement Suite, poetry by R. Erica Doyle, a reading by Marina Celander, and modern big band works by Jay Rodriguez, Albert Marques, Marie Incontrera, and others. This event is the first of its kind in the 21st century: taking the concept of the dance big band of the 1940s and bringing it into the present with new works, revolutionary hip hop (featuring spiritchild, Prince Akeem, and other young artists), liberation of the body, and exciting tributes to the great historical figures of the black liberation movement, including Aishah Rahman. The Eco-Music Big Band is a 15-piece professional big band that spans many generations and includes some of the nation’s most acclaimed jazz musicians. Our roster includes bass trombonist David Taylor (Gil Evans, New York Philharmonic), saxophonist Jay Rodriguez (Ornette Coleman, Craig Harris), bass trombonist Earl McIntyre (Mel Lewis, Thad Jones), Zack O'Farrill and Adam O'Farrill (Arturo O'Farrill, Randy Weston). The Eco-Music Big Band is led by Marie Incontrera, who was Fred Ho's final composition protege. Hailed as “talented... inspiring” (The Vermont Standard), The Eco-Music Big Band is committed to presenting the music of the legendary jazz composers of the 20th century that were overlooked (such as Cal Massey), to continuing the legacy its prodigious composer & founder (the late Fred Ho), and to providing a platform for the next generation of big band composers. This event is presented by the Eco-Music Big Band, A New Black Arts Movement, and Scientific Soul Sessions. Start at 14:15 until 16:30 @ location in the center of Brussels. € 10 donation/ pay what you can give, no one will be turned away. Scientific Soul Sessions is a collective of revolutionary artists, musicians, organizers, scientists & maroons that prefigure a new society, founded in New York City. In 2014 a sister wing was created in Belgium. Every two months we welcome people to our soul sessions. Our sessions are liberated spaces combining arts and politics to create a soul-changing experience for all ages, focused on community and creativity. * Where does the educational system stem from and what is its purpose? * What is revolutionary education? * Which parts of history are not being taught and why? A very special thanks to graphic designer Naomi Amma Kwaakoa Quarteyfor our thought provoking/poking visual. every 4th black sunday a new black arts movement presents commUniversity. rsvp for this first ever xspiritmental learning session. let us know you want this. followed by discussion/strategy session on the connections with South African Liberation Struggles through music and how hip hop continues to be and provide that voice of struggle through movements. Opening with YOUTH open mic 3:30-4pm Sharp! Who will Protect and Defend Black Life? It’s kind of fitting that police officers Darren Wilson and Daniel Pantaleo, murderers of Mike Brown in Missouri and Eric Garner in New York, were cleared of criminal wrong-doing in the last several weeks. The eruption of protest, activism and organizing in response to the (bad) decisions of legal bodies to not hold these officers accountable for their crimes has occurred at a time of special significance for the legacy of theBlack Panther Party (BPP). October 15th saw the 48th anniversary of the birth of the BPP in Oakland, CA. Originally named the Black Panther Party for Self-Defense, the BPP had a self-defense strategy against the brutal terror of the police. The strategy unashamedly and unapologetically maintained that Black people have human rights that are to be respected, including the right of armed self-defense, and BPP members had a right to intervene with those arms if necessary when law enforcement – those touted as the ones whose job was allegedly to protect and serve – violated those rights. In Los Angeles, the month of October also saw the deaths of Ronald and Roland Freeman, brothers who were co-founders and leading members of the Southern California Chapter of the Black Panther Party. Ronald and Roland, who were born one year apart and died one week apart, were also survivors of the Dec. 8, 1969 shootout with the Los Angeles Police Department’s SWAT team on 41st Street and Central Avenue. The pre-dawn attack, the SWAT team’s first major engagement, lasted 5 hours and saw 13 members of the BPP stand trial for attempted murder of police officers. All 13 of the Panthers would eventually be acquitted of all charges in December, 1971 due to the illegal actions of the LAPD. One day after the New York grand jury failed to indict Pantaleo (Dec. 4) came the 45th anniversary of the murders of Mark Clark and Fred Hampton by Chicago Police. The pre-dawn “shoot in” was the result of collusion between the local police, the Federal Bureau of Investigationand the Illinois State’s Attorney’s office to neutralize Hampton and the work of the Illinois Panther Party. Images from films and popular culture saturate our consciousness of stern-looking, black leather-jacketed and black beret-wearing young men (predominantly) holding shotguns, some with bandoliers strapped across their chest. Those images are intended to instill fear and, in today’s climate, a bit of incredulousness. Along with those images are the mischaracterizations and outright lies that the BPP wanted to kill whites and police officers. Racist white police officers – overzealous in the performance of their “duties” – often bore the brunt of the Panthers’ strategy but the BPP understood it was not about individual officers but a system that allowed for violations of Black life. With law texts in one hand and guns in the other, police officers that were observed violating the human rights and dignity of Blacks were confronted with a choice. The majority of those confrontations were resolved without fanfare or gunplay. The Panthers’ self-defense strategy is primarily ridiculed and condemned as militarist and adventurist but rarely acknowledged as a central tenet of human rights activism. If we focus on the idea of the Black Panther Party for Self Defense and not the image we have been given, the idea makes perfect sense. Imagine that, instead of bystanders filming CHP Officer Daniel Andrew mercilessly beating a helpless Marlene Pinnock by the side of the I-10 freeway last August, a handful of those bystanders had trained their weapons on Andrew, demanded he cease and desist, handcuffed him and waited until a commander from the CHP arrived on the scene? Another scenario: imagine if, in addition to Ramsey Orta filming the murder of Eric Garner by Pantaleo, bystanders had intervened and subdued Pantaleo who continued to keep Garner in a chokehold after Garner was on the ground and complaining of not being able to breathe? Or: if some of the residents of Canfield Green Estates in Ferguson, MO, had surrounded Officer Darren Wilson after he had emptied his service weapon in a populated apartment complex in broad daylight, killing Mike Brown with six shots; what if those residents had surrounded Wilson and demand that he cease and desist, disarmed and handcuffed him, and then delivered him to the Ferguson Police Department? In spite of the shenanigans of the Ferguson PD, imagine: in all instances, Black lives could have been spared; abusive police officers would have been immediately neutralized; and the citizens themselves would have played a role in maintaining a safe and secure environment for themselves and their families. Thousands of people rally at the Hall of Justice in downtown Los Angeles December 11, 1969, three days after the LAPD’s SWAT unit illegally attacked the Southern California Chapter of the Black Panther Party headquarters on 41st Street and Central Avenue in South Los Angeles (Los Angeles Herald Examiner Newspaper). The characterization of the BPP via popular culture and law enforcementlies does not match the current reality of police murders occuring today. The overwhelming majority of police murder victims that activists have been calling attention to were either unarmed or nonthreatening at the time of their deaths, calling into question why there was a need for police presence at all; or the officers lied and/attempted to cover-up their crimes. In both instances, the legal system which claims both moral authority and jurisdiction over such matters has failed to hold police accountable for their crimes or secure a modicum of punishment for the officers’ crimes. That translates into a lack of respect for and protection of Black life. Who will protect and defend Black life when those who are charged with protecting and serving are the very ones who violate our right to life … unjustifiably and with impunity? The murders of Garner, Brown and countless others have unleashed a fury of activism and organizing not seen since the BPP was on the American landscape. This current iteration of activity, like many of its predecessors, has connected the dots of racism, militarism and economic exploitation that Dr. Martin Luther King, Jr. talked about. They have linked the heightened militarism and terrorism of local police with U.S. foreign policy, and laid bare a domestic policy that relies on punitive measures such as stop-and-frisk and.over-incarceration to the shredding of a social safety net. The bulk of the activism and organizing of these young people has involved direct-actions and civil disobedience. The majority of their actions have been nonviolent. The majority of actions in opposition to them – by law enforcement and right-wing, white supremacist organizations such as the Ku Klux Klan – have been violent or encouraged the use od violence. This is unacceptable. Huey Newton and Bobby Seale, co-founders of the BPP, believed the organization to be following in the logical footsteps of Malcolm X who believed in the sanctity and the assertion of Black peoples’ human rights “by any means necessary.” Malcolm X was seen as a necessary – and scarier – counterbalance to Dr. King. In order for this new movement to be successful, a movement currently challenging the failure of the legal system to hold its officers accountable for the murders of Black people, this new generation could also use a counterbalance. They shouldn’t have far to look for some ideas. Thandisizwe Chimurenga is a freelance writer living in Los Angeles. She is the author of No Doubt: The Murder(s) of Oscar Grant; a contributor to Killing Trayvons: an Anthology of American Violence, and to the forthcoming Hands Up Don’t Shoot: Collected Essays/Stories on the Racialization of Murder. Know your Rights! Know your Roots! This soul session focuses on uplifting our communities by honoring Indigeneity and studying the art of StoryTelling. -PLUS a Teaching Artivists cypher from experienced professionals working with youth and indigenous peoples to bring their stories to the public in safer spaces. Join us for the After Party to Celebrate a year of Collaboration with the Next Youth Coalition and the closing of the Right to Remain gallery! !